Peter Huntoon painted for a crowd at the Killington ART Garage, creating a new piece of work before their eyes. KILLINGTON — Friday night, July 17, at the Killington ART Garage was an outstanding blend of the best Vermont has to offer. 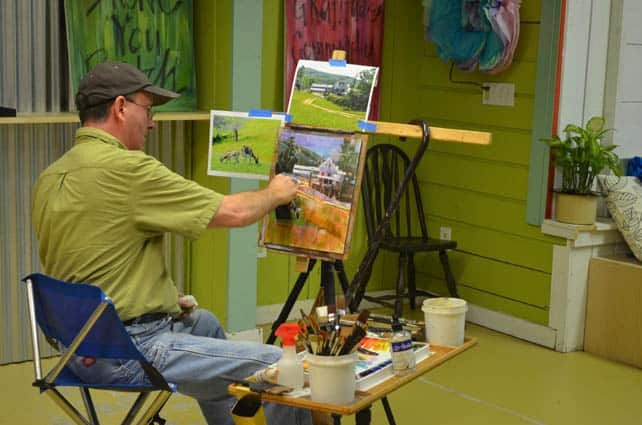 Peter Huntoon, most famously known for his watercolor painting, demonstrated his work start to finish, painting his interpretation of Amee Farm, which is home to Sweet Georgia P’s, in Pittsfield for a group of adults hoping to learn from his style and skill. Rebecca Pimentel, owner and managing member of Sweet Georgia P’s, provided samples of their goat chevre cheese and raw honey. Also on hand was Boyden Valley Winery, located on Rt 104 in Cambridge, Vt., whose representatives poured samples of their international award-winning wines, ice wines and spirits. And if that wasn’t already a sweet deal, Nutty Steph’s hand crafted chocolates were also available for sampling. It was a terrific display of local talent, food and wine. The White River Valley Players’ Summernight was a success!